Boatersland Marine has the replacement parts you need to fix and repair the Raritan marine toilet on your boat. The Raritan G13W impeller comes with the PTFE washers and pump gaskets you need to finish the installation. Boatersland Marine stocks a wide range of replacement parts for Raritan marine heads, including pump rebuild parts, seals, gaskets and other wear items, so you can keep your boat’s plumbing in top working condition. 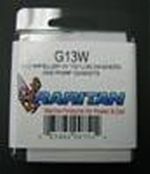 Raritan parts such as this G13 impeller and related parts are original equipment parts that come with a warranty from Raritan, so you know they will fit right and be exact replacements for the original parts.